In a large bowl, stir together oats, yogurt, milk, and honey. Cover and chill in refrigerator overnight or at least 2 - 3 hours. For berry topping, heat frozen berries and sugar in a small saucepan over medium heat, stirring occasionally, for approx. 5 - 7 min. until mixture has thickened slightly. Remove from heat. 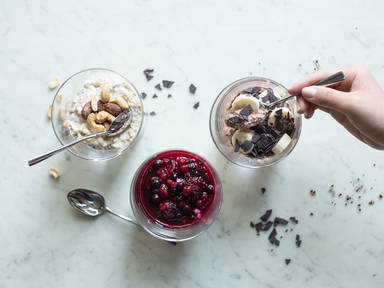 To serve, spoon one third of the oat mixture into a glass and top with berries. For nut topping, chop walnuts and mixed nuts and combine with honey in a small bowl. Stir in one third of the oat mixture and transfer to a serving glass. If desired, top with extra nuts to serve. For cocoa topping, slice banana. Then stir cocoa powder and two thirds of the chocolate shavings into one third of the oat mixture. Transfer to a serving glass and top with banana slices and one third of the chocolate shavings. Enjoy your favorite variation for breakfast or as a snack during the day!